Astute Creating Curious Kids readers know that I typically review nonfiction books each Friday. However, I was lucky enough to win a copy of Ame Dyckman’s first picture book, BOY + BOT, on Tara Lazar’s blog. After reading our new book to more than 20 children over a couple of days, I knew I had to review it for Perfect Picture Book Friday. Opening and synopsis: ”A boy was collecting pinecones in his wagon when he met a robot. This is a tale of an unlikely friendship — boy and bot — and how they both care for each other in their own way. When bot’s power switch gets turned off, boy thinks he’s sick. When boy goes to sleep, bot thinks he’s ill. The boy feeds bot applesauce; the bot feed boy oil. The boy reads the bot a story book; bot reads the boy an instruction manual, and so on until both are healed. Why I like this book: I recently read this book to a preschool class of both boys and girls, and both were captivated. This book’s brief text and bright illustrations –by none other than Dan Yaccarino — are perfect for story times or reading at home over and over again. Resources: Have children imagine what they would do with a robot friend if they had one. What would they play? How would they make their robot friend feel better if he was sick? Using the story framework, older children could rewrite the story with their own words and images. 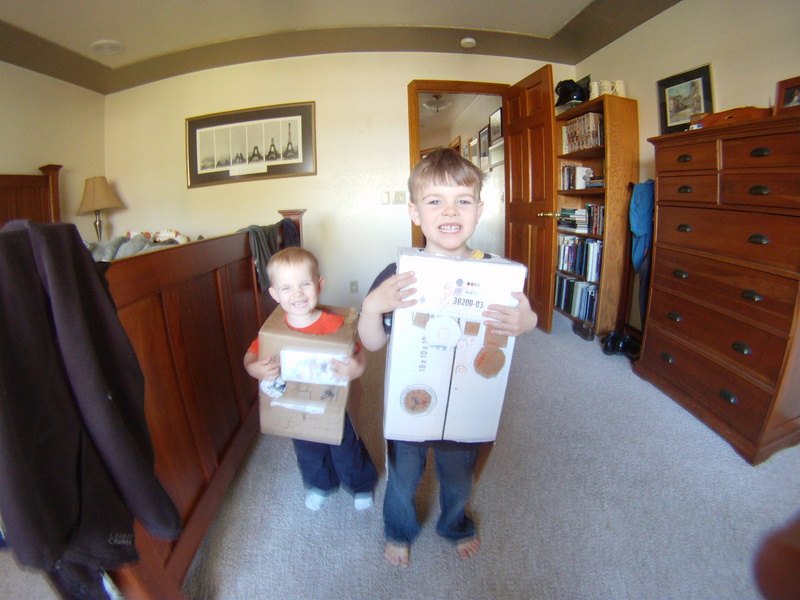 Making robots out of cardboard boxes is also fun, though you could also do it with a paper bag. Cut a slit up the center of the box or bag, so it opens like a vest. Cut holes for the head and arms. Decorate with dials, switches and gauges made of cardboard, crayons, marker, etc. You also can make mini recycled robots out of toilet paper rolls and pipe cleaners, which I described in our Earth Day post. There’s a lot of robot ones today, I can’t wait to try the crafts! Ohhh, I can’t wait to work my way through the list then. We love robot books. Yaccarino’s “If I Were a Robot” is another favorite. I always love your PPBs, Kirsten! This one sounds like such fun. Thanks! It’s very cute for the preschool set. They loved it. Both the story and illustrations look bright and fun. More robots on the list. I need to get through this list. Fun ones today so far. I always appreciate your nonfiction books, but love this one too. It’s a fun book: typically boy subject matter but with a beautiful, emotional story. I can’t wait to read this book! Heard so many great things about it, and now your review too! I just love Dan Yaccarino! I’ll read anything he’s illustrated. This looks delightful, Kirsten! Thanks for sharing! I’m always amused at how certain themes seem to show up on the PPBF list each week – 3 robot books this week! – isn’t that funny? And I don’t think we’d had one yet up to this point. Also, several imagination books this week. Both wonderful! I do think the synchronicity is pretty amazing. There was one week two of us reviewed Joyce Sidman books. Great minds think alike! great idea on the writing exercise. also liked the pic of your robots. Thanks Darshana. I’m kind of partial to my robots too. And we loved “Robot Zot” thanks to your fabulous recommendation, Clar. Honestly, I think we’ve read just about every Schiezcha book available thanks to you! I don’t think I’ve even read a robot book, but this book seems adorable. Great choice Kirsten! Such a unique book. Is it a concept book? Patricia, as far as I understand them, this isn’t a concept book but rather a straightforward picture book. I’ve heard about this book, and now I know it will be perfect for my boys. Thanks! This is definitely a perfect book for preschoolers/toddlers. My almost-kindergartener enjoyed it, but I think it might be a bit young for elementary students, if that helps. This looks like a fun book! I love the kids pic 🙂 I remember us building cardboard box robots! What a fun memory this post brought back for me. My husband also built them an outdoor playhouse out of cardboard boxes once. Boxes are such a fun blank canvas. Dan Yaccarino has some pretty cool books. Thanks, Kirsten, this one sounds great! Yaccarino is a favorite around here. Happy Birthday Dan Yaccarino! Thanks for inviting me to view your review of Boy + Bot! It is so cool that you were able to share the book with so many! And thanks for reminding me of all of Dan Yaccarino’s other, amazing books. Happy birthday, indeed. Cute! Cute! Cute! Affirmative! Have to read! Affirmative! Love Dan Yaccarino! Affirmative!